" Best Western - Americana Lodge - Sacramento, California - C. 1960. " 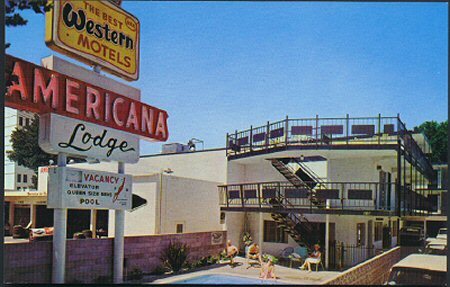 (1648) POSTCARD: Best Western - Americana Lodge - Sacramento, California - C. 1960. -Condition: Very Good. - Not Posted. Glossy photo of back of the lodge with a swimming pool. Has a few people at the pool. Shows sign for the lodge also. Price: $3.00 + shipping.